When I was little, the days after Thanksgiving were loaded with leftover turkey sandwiches, dressed up every which way. 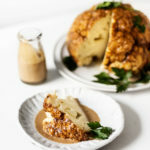 My leftover traditions are quite different now, but they still include plenty of leftovers. Usually I throw everything in a giant salad: leftover roasted sweet potatoes, stuffing, cranberry sauce, all of it. It’s a treat, a flavorful smorgasbord that I look forward to every year, but this year I realized that I didn’t have to wait for Thanksgiving in order to create a salad that felt like a celebration of the season. 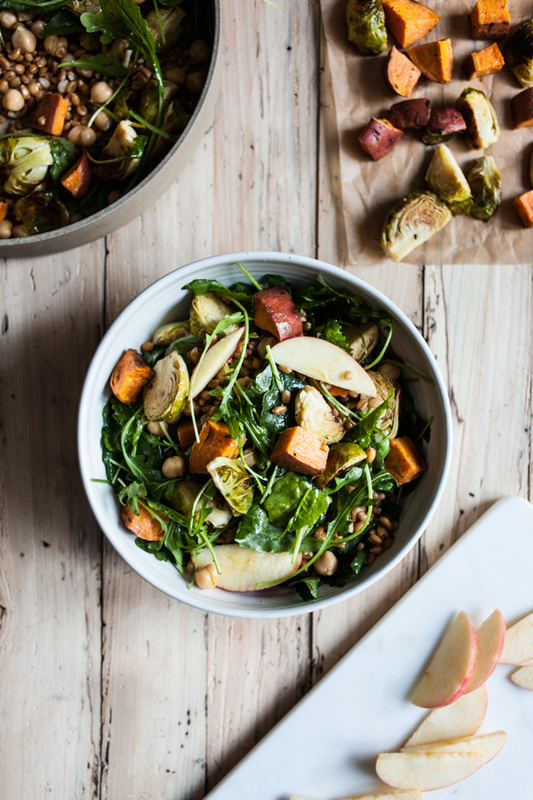 This vegan autumn harvest salad is brimming with roasted sweet potatoes, brussels sprouts, and crisp apples, and it’s a wonderful way to give thanks for fall. The salad is also a celebration of local produce. 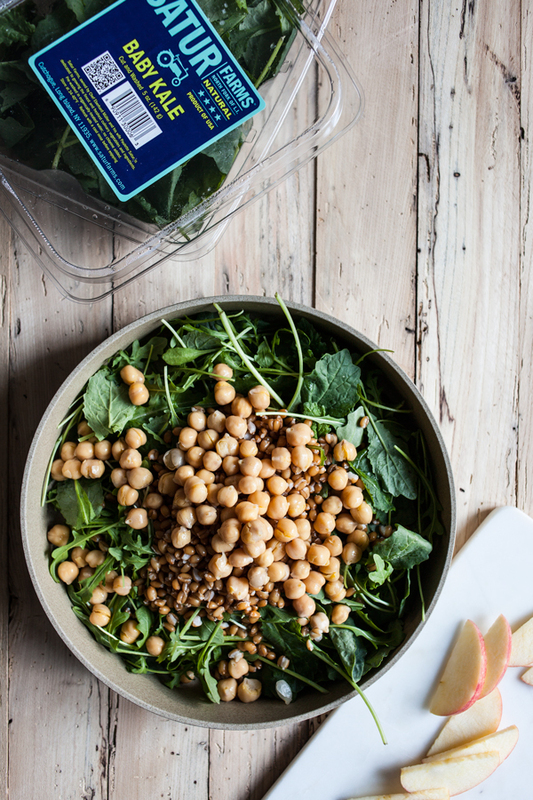 The greens in particular have a special story: they’re a mixture of baby kale and baby arugula from Satur Farms, a New York state vegetable farm that produces green leafy vegetables (including bok choy, rapini, and chard), herbs, microgreens, salad greens, and even specialty vinegars. I recently had a chance to visit Satur Farms as part of an opportunity to learn more about a new labeling initiative that will make it easier for New York state consumers to identify and support local produce. 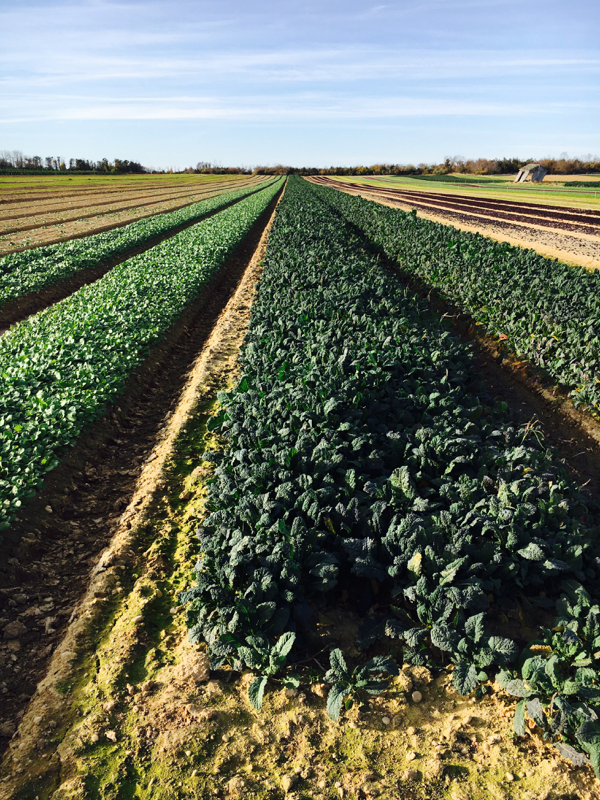 The New York State Grown & Certified label is a voluntary program for state farmers, which ensures that they work to conserve natural resources and use farm-safe practices. The program–and its associated New York State Grown & Certified seal–allows shoppers to consciously support locally grown foods and environmental stewardship. 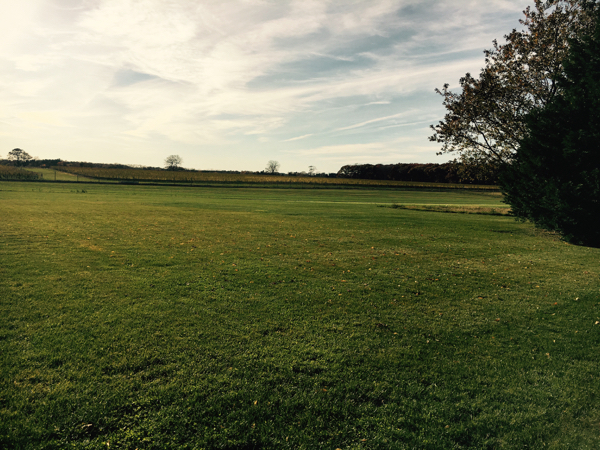 Satur Farms is located in the North Fork of Long Island, near the Long Island sound. Its owners, Eberhard Muller and Paulette Satur, have a lifelong interest in food and how its grown (Muller was a chef before he began working at the farm full time). 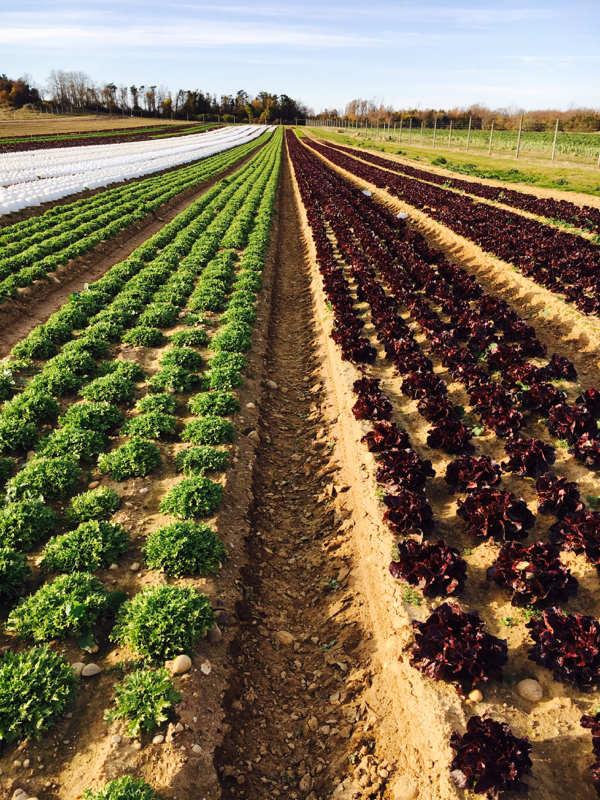 They’re passionate about quality produce and using sustainable methods to grow and harvest it. Their farm is one of many that will be participating in the new NY State Grown & Certified program. Eberhard and Paulette were delighted to host me and a small group of bloggers several weeks ago, and to show us how they grow their specialty salads, leafy vegetables, heirloom tomatoes, root vegetables, and herbs. Paulette and Eberhard use cover crops and crop rotation to help protect the soil on their farms. They’re also committed to recyclable packaging and to using as much vintage farm equipment as they can. 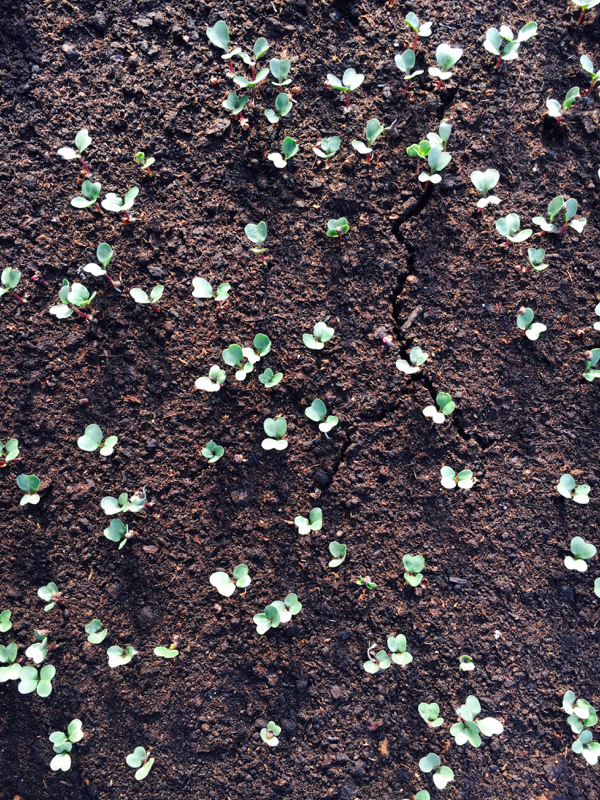 It was interesting to hear about their methods and to see their vegetable crops in various stages of growth, from tiny little seedlings to lush, bright green bunches of kale that were almost ripe for picking. I’ve enjoyed Satur greens for a long time, so it felt like a special treat to see their origins. I was lucky enough to come home with baby kale and baby arugula from Satur Farms, as well as some local apples, and I was eager to put them to use in a salad that would feel big, abundant, and seasonal. I paired my produce with some cooked spelt berries, which I love using in autumn salads: their nuttiness and chew seems to compliment root vegetables so nicely. 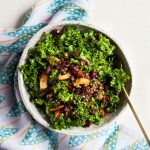 If you’d like to make this salad gluten free, you could easily use cooked brown rice, quinoa, buckwheat, or sorghum in place of the spelt berries. Preheat your oven to 400F. Transfer the brussels sprouts and sweet potatoes to one or two lined baking sheets and drizzle them with oil. Use your hands to evenly coat the vegetables with the oil, then sprinkle them generously with salt and pepper. Transfer to the oven and roast for 35-40 minutes, or until all of the vegetables are fork-tender and gently browning. While the vegetables roast, whisk together the shallot, vinegar, Dijon mustard, and olive oil. Season the vinaigrette to taste with salt and pepper and set it aside. When the sweet potatoes and brussels sprouts are ready, allow them to cool slightly. Combine them in a very large mixing bowl with the spelt berries, greens, and apples. Add and handful of dried fruit (such as cranberries), nuts, or seeds if you like. Add the vinaigrette and toss well to combine. Season the salad to taste with extra salt and pepper, then serve. Dressing and roasted vegetables can be prepared a few days in advance. As you can see, this salad serves a nice big crowd, but you can easily cut the ingredients in half to create something smaller. And if you’d like to modify the salad to accommodate your Thanksgiving leftovers, do! 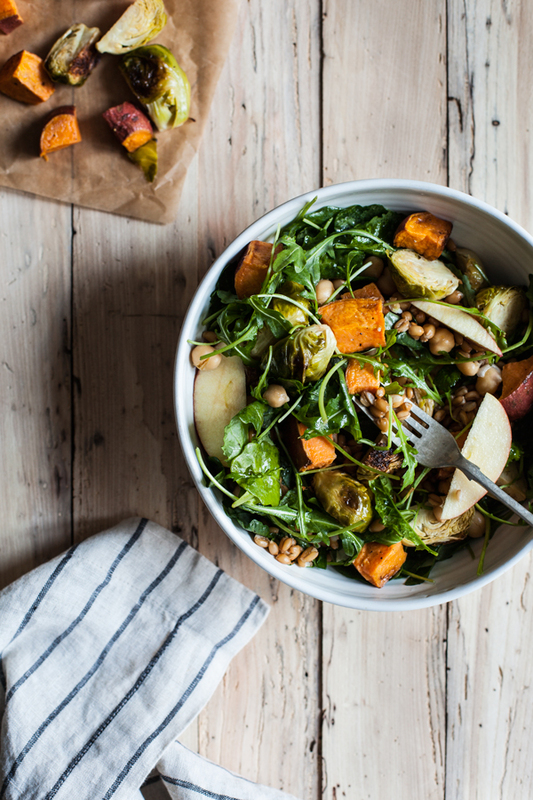 You can replace the sweet potatoes and sprouts with any roasted vegetable, the spelt berries with leftover stuffing or croutons, the apple with cranberry sauce or something else that’s sweet. Whether or not you’re celebrating Thanksgiving this afternoon, I wish you a day full of blessings. This is a sponsored conversation written by me on behalf of Empire State Development . The opinions and text are all mine. This is such a gorgeous salad! Looks super filling too! Oh I love this salad so much Gena. We, too, have really nice farmer’s markets here in Atlanta and I love coming home with freshly picked veggies. 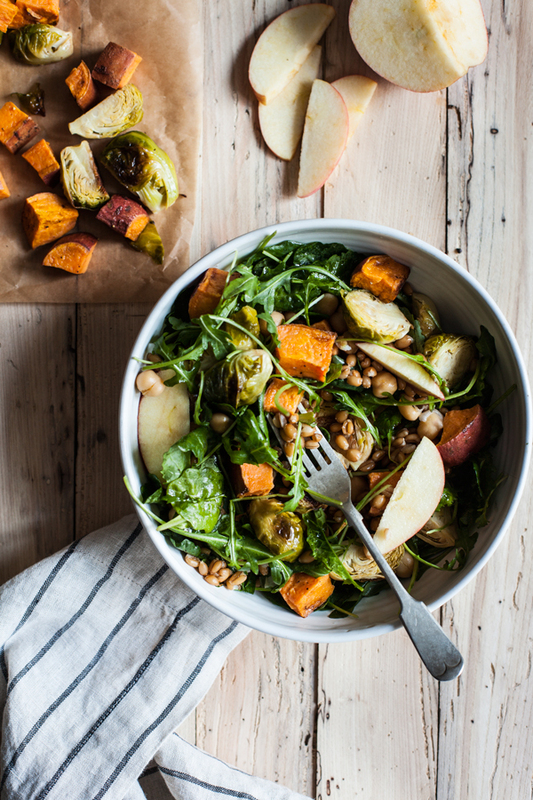 This salad with all the autumn veggies and healthy grains look and sound so good. Totally up my alley. I also love the shallot and dijon dressing. Funny thing is that I have all the ingredients at home. 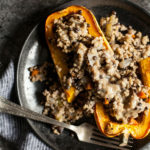 🙂 Once we are finished with the leftovers from our Thanksgiving meal, I will give this dish a try. I hope you enjoyed your Thanksgiving. A life long love of farms makes this post extra enjoyable for me. I’ve worked on vegetable farms and know first hand how much work goes into it. Thank you for sharing this and your lovely, delicious recipe. Yummy definitely making this with leftovers! Thanks for sharing happy Thanksgiving! This salad looks so good! I’ve just recently discovered using brussel sprouts in salad. It’s delicious! This is a wonderful and colorful salad recipe, tried it last night and added toasted almond as well, it was delicious!